Crumble must be the pudding equivalent of soaking in a hot bath and getting into your pyjamas before snuggling on the sofa in front of the TV. A comfort blanket of a pudding meant for blustery Sunday afternoons and dark frosty nights. 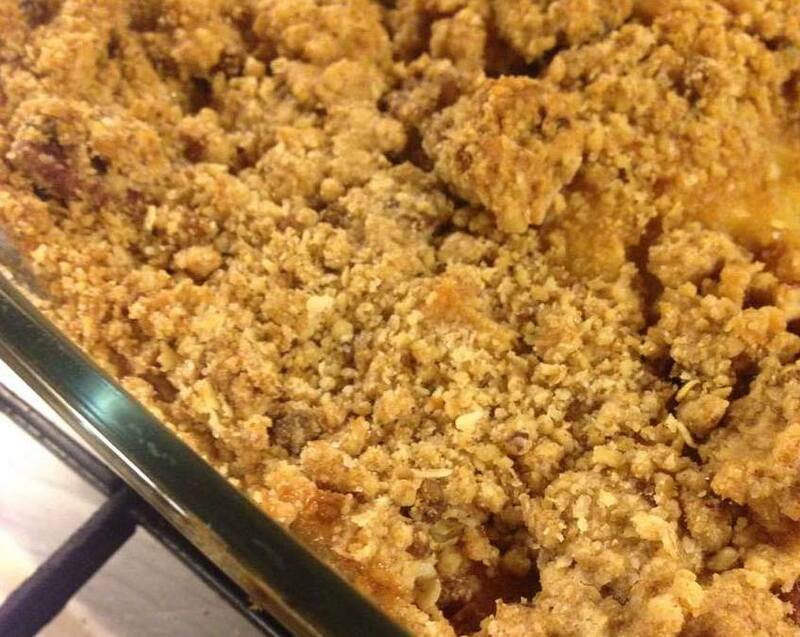 Years ago at uni, a bring-and-share church lunch brought with it the most delicious apple crumble I had ever tasted. Sadly I can’t remember the cook who shared their recipe with me, but their crumble hasn’t disappointed. Sweet and crunchy and warming, this one is a winner. Chop up the apples and mix with the caster sugar and tablespoon of flour, then tip them into a greased oven proof dish. Next tip the Quaker oat sachets into a bowl and mix in the cinnamon and nutmeg. When I first got this recipe you could buy actual cinnamon sachets but these seem hard to find now, adding ground cinnamon seems to work just as well. I think the nutmeg is nice to add too but you could also try ginger or allspice. Then mix in the pecans (break them up a bit first) and the 200g of flour. Finally, add the butter – either rubbing it in with your fingers or using an electric mixer. Tip all this into the dish to cover the chopped apples and bake for about 45 minutes. You should have a seriously tasty crumble on your oven-mitted hands.